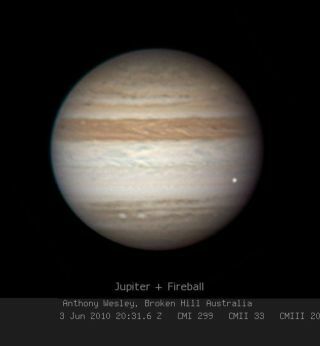 This photo of Jupiter taken June 3, 2010 by Australian amateur astronomer Anthony Wesley shows a bright fireball from an apparent meteor or other object. Skywatcher Christopher Go of the Philippines also caught the event on video. Full Story. The huge, burning object thatslammed into Jupiter last week still remains a mystery to scientists who arecurrently examining this latest impact on the gas giant. The newest Jupitercollision was spotted Friday by amateur astronomers Anthony Wesley inAustralia and Christopher Go in the Philippines. It occurred less than a yearafter another object whacked Jupiter last summer. Scientists are now analyzing theimpact, in hopes of being able to identify the cosmic object that crashed intothe largest planet in our solar system. For the time being, however,there is no consensus on what it was, said Heidi Hammel of the Space ScienceInstitute in Boulder, Colo.
Hammel was the lead researcher ofa study that was recently published in The Astrophysical Journal Letters, whichdetermined that a rogueasteroid about 1,600 feet (500 meters) was the culprit in anotherspectacular crash on Jupiter that occurred on July 19, 2009. It was Wesley, too, who firstspotted the July 2009 Jupitercrash. His observations kicked off an international observation campaign tostudy the impact site. Studies about Jupiter's latestimpact are already underway, though no results have been released so far. "We are working on the dataanalysis and I cannot say news on this," Agustin Sanchez-Lavega of theUniversity of the Basque Country in Bilbao, Spain, told SPACE.com in an e-mail. With this new collision comingless than a year after the July 2009 incident, researchers are rethinking currentestimates of the frequency of such planetary impacts on Jupiter. "Certainly the impactprobability statistics seem to need revision, based on these two events withinthe past 11 months," Hammel told SPACE.com. Jupiter is certainly no strangerto violent impacts. In 1994, the cometShoemaker-Levy 9 broke into more than 20 pieces and pelted the gasgiant repeatedly. At the time, astronomers estimated such impacts could occuron Jupiter every 50 to 250 years.